Beaded plywood is a form of plywood that is used as ceiling cover in place of drywall in outdoor areas like a covered porch. It provides a cover for the ceiling and also acts as a décor item as well. Beaded plywood gives character and a unique linear quality to the ceiling. The best thing about beaded plywood which makes it better than drywall is the fact that it can be stained and left untreated unlike drywall and can be painted in any color you like. So, if you are looking to give your outdoor applications a makeover than going for plywood ceiling is a very good option. Installing a beaded ceiling is not a very difficult task and you can perform it with consummate ease making use of a handful of simple handheld tool. 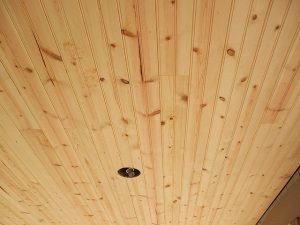 The following is a detailed step-by-step guide on how to install the beaded plywood ceiling on your own. 1. Place a step ladder under the ceiling and with the use of a putty knife, scrape off any kind ceiling texture that might be present there. 2. Ascertain the location of the centers of the ceiling joists on either side of the area where the beadboard will be placed. Mark the locations using a chalk. 3. After measuring the distance in between the ceiling and the floor, using a circular saw cut a pair of 2×4 boards to this length. Cut another 2×4 board in to a pair of 48 inch long sections. Form a t-shape brace by placing one of the larger two boards on edge on the floor and centering one of the shorter boards square to the longer one. Complete the t-brace by driving two 3-inch screws through the short board into the long board using a power drill. 4. Using the direction of the beads as the reference, measure 8 feet from one corner and try to located the center of the nearest ceiling joist. 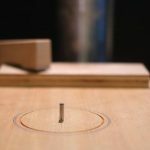 Determine the length of the first piece of beaded plywood you would need by measuring from the centre of the joist to the corner. Mark out this distance on the plywood using chalk lines and then cut it accordingly. 5. Climbing the step ladder, hold the plywood in place on the ceiling and ask someone to place the t-braces in between the ceiling and the floor to keep the plywood in place. Now take 2 ½ inch finish nails and drive them at a distance of 6 inches into the ceiling joists that you had marked earlier with chalk. Finishing installing the first row of the plywood pieces in the same manner with the help of the t-braces. 6. Keeping the alignment of the beads the same, add the rows one after the other until the whole ceiling is covered. 7. Add a crown molding on the perimeter of the plywood ceiling to provide a nice finished transition to the wall and at the same time hiding any edges that remain.